Next up in our Spring Break travel series: the vacation souvenir. What to buy, what to skip, and how to find souvenirs for free! One debatable purchase when traveling is whether or not to buy a souvenir. On one hand, skipping purchasing souvenirs can save you money while you’re on vacation. But some people genuinely really enjoy having a memento from their trip. Before you break your travel budget on useless souvenirs or on the other hand, skip out on them completely, there is a way to have the best of both worlds. In my own travel experiences, I’ve discovered a plethora of free souvenirs, more practical souvenirs, and tips for both. First, here are some of my favorite free souvenirs. If it’s important for you to bring something back, keep it in the back of your mind during the trip. If you’re looking for it and open to it, you may find something free and unique to be your souvenir. Scrapbooking is a fun way to make your travels, as well as any other special event, an activity to do when it’s over to keep the memories alive. When you’re on your trip, you’d be surprised at the things you will be able to grab for no cost that can give a personal touch to your scrapbook. Things like a menu, receipt, a dried flower or leaf, a map, and ticket stubs are common things you’ll find. My main “souvenir” from my travels is always my pictures. You can create slide shows or movies on your computer, put your photos in frames when you get home, share them with your family and friends, create albums, and more. You can even get creative with your photos. Collect photos of your family in front of welcome signs for every state, of sunsets in different places, or of your favorite meal from each trip. Many times at restaurants, bars, breweries, or wineries, they have coasters with their logo. Grab a few extra, and then you can use them when you get home. When you’re at any type of sporting event, concert, or amusement park, chances are they have a cup or glass with the team’s logo or something else that makes it worth keeping. When I traveled visiting breweries last summer, many offered free glasses when you paid for a tasting or went on the tour. If you decided to save money by going camping, you’ll have a great chance to take a souvenir from Mother Nature. Things like rocks, sand, pine cones, or even twigs can make great home décor with a creative touch. Put them in a glass vase or in another dish to display. Be open minded, and you might come across great free souvenirs. While attending a Farmer’s Market in South Dakota, they were giving out free cloth bags to stock up on goods. The bag says “South Dakota” on it, and every time I use it, I think of my fun time in the beautiful state. Spices that are special to that area make for a great thing to bring home. Every time you cook with them, you’ll remember the unique smells and tastes of the food from your trip. Choose spices that have a long shelf life. Similar to spices, you can always find smart choices of food to bring back with you. While visiting Colorado, I was able to bring home some tasty elk jerky that I would have never been able to find in my hometown. Look for items you can use in your home like blankets and pillows, picture frames, or cooking utensils for something you will use all the time. Skip the T-Shirt that says “Boston” on it, and go for something you can wear all the time. Every time you wear it, you’ll remember your trip. Sunglasses I bought on a sunny day in Florida, a nautical looking scarf I bought in Maine, and a pair of boots in Wyoming are some of my favorite things to wear. For kids, skip the stuffed animals or cheaply made toy. Let them get something educational and entertaining so they get the most out of it. Choose puzzles, books, or other educational toys. Skip cheap, poorly made items that will end up getting thrown away, broken, or stored away right after you arrive home. Before making any purchase, consider if it’s something that you’ll actually get use out of. Face it – a little statue of the Statue of Liberty may be nice, but are you actually going to hang it in your house? Are you actually going to wear that t-shirt or use that key chain? Is this something that is easily transportable back home? Consider the expense if you have to pay to have it shipped or pay extra for baggage. If something is glass or delicate, it may not be a good idea to try to transport it. Food and liquid also have different rules in places around the world as well. Don’t buy souvenirs for people. You may feel differently, but in my opinion, I’ve never probably truly appreciated a souvenir from someone else’s trip because it wasn’t my trip. Instead of buying souvenirs at gift shops or tourist traps, go to more affordable stores. Try thrift stores, farmer’s markets, craft shows, and even garage or yard sales. I found a cookbook with tons of great seafood recipes at a garage sale on the east coast, which was my favorite memory from traveling there. If you’re traveling with children, give them a souvenir allowance in the beginning of the trip. Whether it is $5, $20, $50, or whatever you feel is an appropriate amount, tell them this is their money, and they can spend it on whatever they want. This way, they will not keep asking for money, and they will learn a valuable lesson in budgeting and the worth of their money. Even better, have them earn their trip money before by doing things around the house or extra chores. 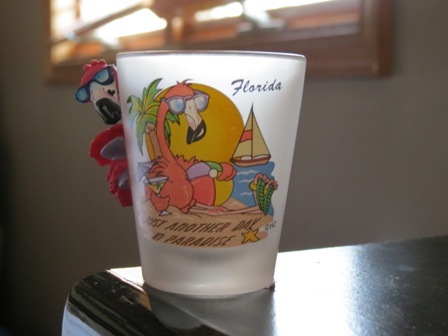 What types of free souvenirs have you gotten from your travels? How do you save money on souvenirs? Another option for kids is to buy things to bring on the trip. A friend of mine bought a bunch of affordable disney stuff before they went to Disneyland and brought it with her. Then she was able to give her kids things on their trip that she didn’t buy at the overpriced gift shops. I’ve always picked up a small charm. I choose something that goes with the state I’m in.Alaska was a smalleagle in flight, Florida was the shape of the state. I usually buy practical things for my home, but another favorite is to buy a Christmas ornament. That way my tree is decorated with all the places I’ve been!